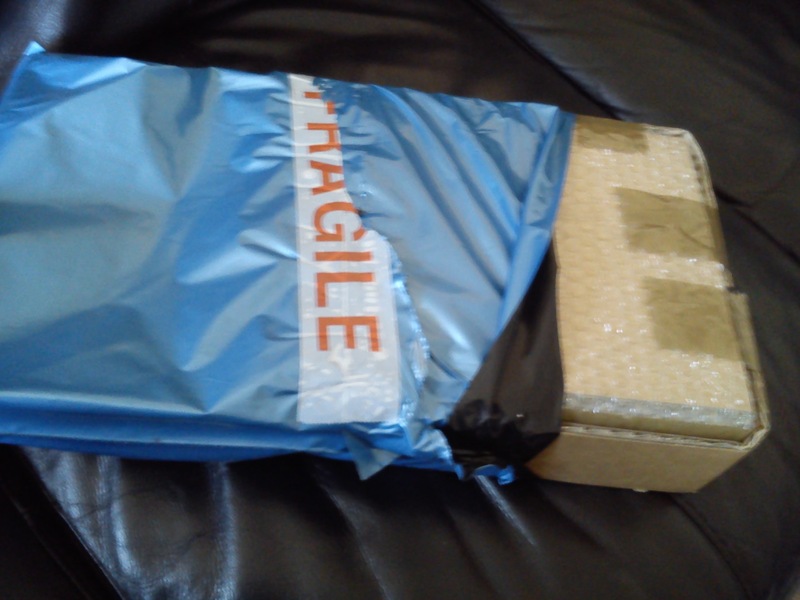 I was very happy to be contacted and asked if I would review a photo on canvas company. Brilliant timing as I was considering buying some canvas prints of my boys as I haven’t printed anything for such a long time. The downside to digital media. When I checked out the YourImage2Canvas.co.uk website I was pleasantly surprised by the prices, not only were many of the canvases reduced but they also had a 3 for 2 offer on. This meant I got a Medium and 2 smaller canvases for under £50 which is amazing. The 3 for 2 finished on 15th of February I’m afraid. re is another cracking offer on their website though, I know a lot of my online friends like competitions too so have a peek here upload a favourite photo for a chance to win £150 of vouchers! I did enter myself whilst I was there with a photo from Aussie (I can’t resist competitions). 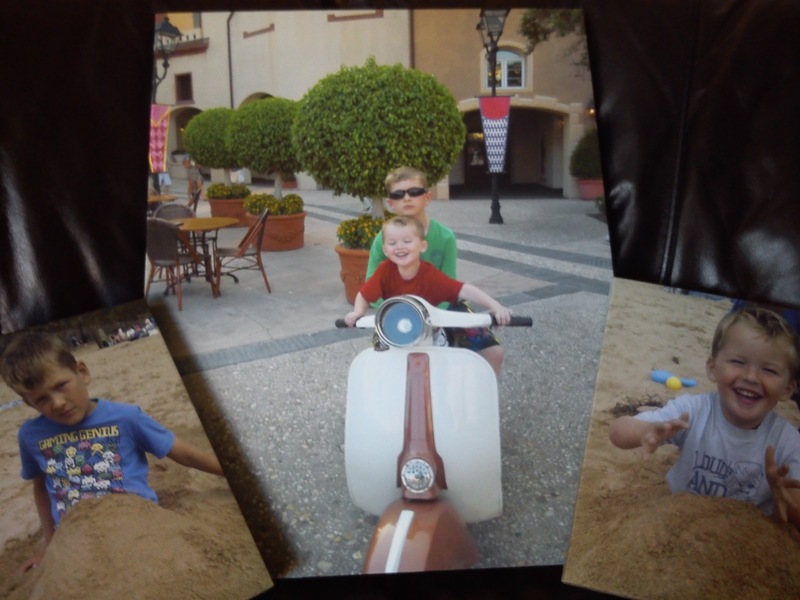 For my bigger canvas I’ve gone for a photo of my boys on a vespa bike in Florida. 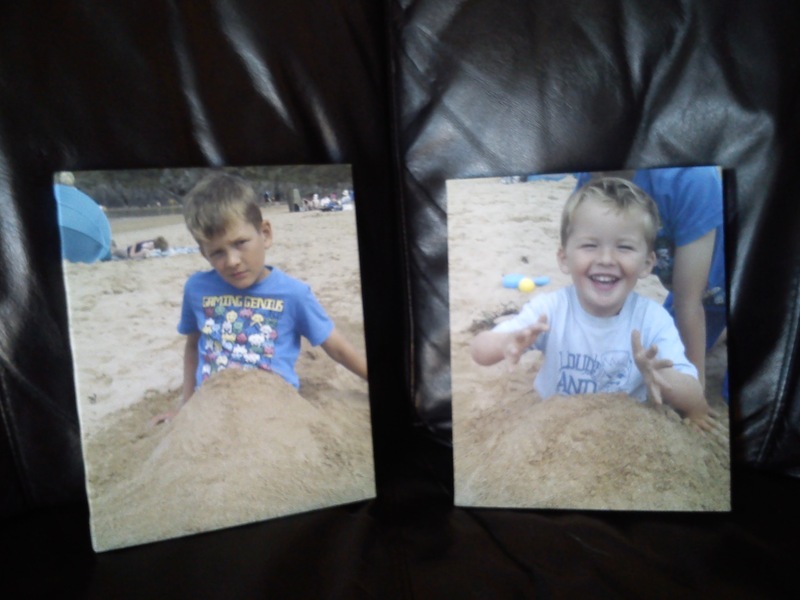 The two smaller ones are images I like, my sons buried in sand on a Cornish beach. These aren’t technically the best quality images as they were taken on a camera phone, so I’m interested to see how these small two in particular turn out. Clicking on this image will open it larger…. 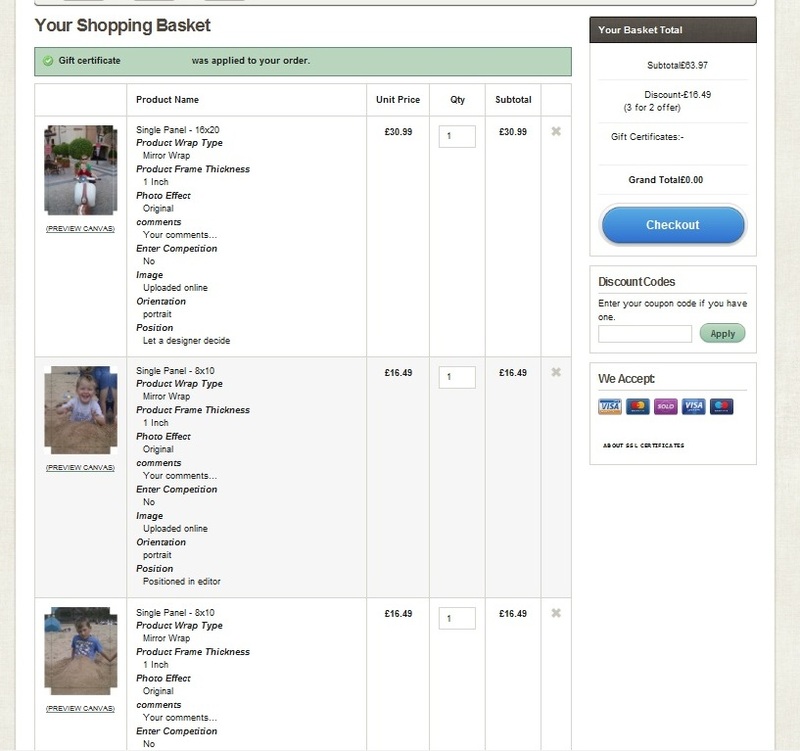 Ordering online was very easy, all the options are on one page, you choose a size (which is what set the price), then landscape or portrait, and a few options about the edging of your canvas. It’s all user friendly, little tick boxes and you just go with what you prefer. Lastly you upload a photo, and you can zoom in or out and reposition your photos. The nice little touch I thought was after you upload your photo there is another box you see, you can tick it to allow their own staff to resize and position in the way they feel will be best. My advice, scroll to the bottom, upload a photo then choose your options afterwards, its hard to choose your options if you aren’t sure which photo you are going to choose. For me deciding was the hardest part. Delivery was free and if you order before 3pm you are offered next working day delivery. Saturday delivery is for a fee but fair enough really. On the order confirmation email it explained the charges, they use both city link and royal mail. The weekend fee is simply because they get charged more. 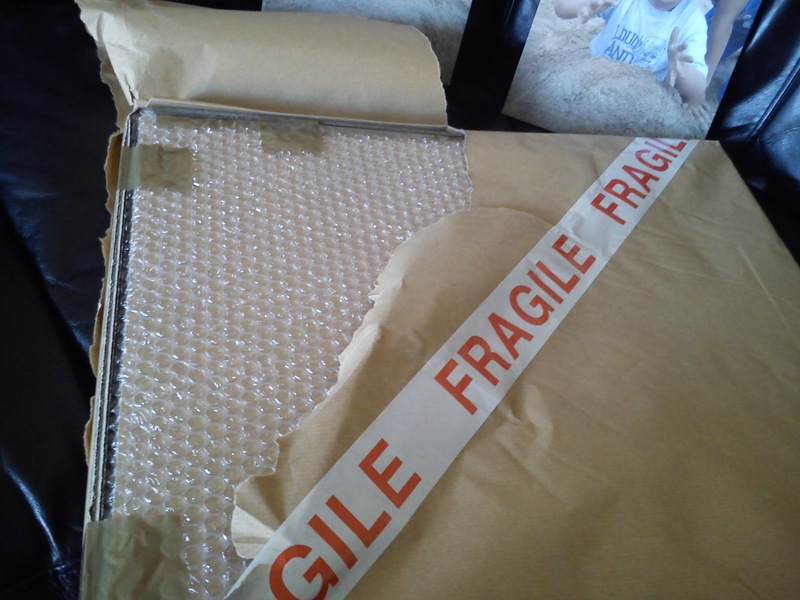 OK then, real review time, my canvas art just arrived by city link, friendly delivery guy and no damage. They were particularly well packed though! And here is the finished artwork! I love them. Here are my monsters. A matching set of mini canvases. D has his normal photo face, serious and head to one side.. Jen also has his standard photo face on, all giggles and teeth. This is the big print. Note the same facial expressions? Told you, photo faces. This is special to me, this is taken on our only international holiday. Universal in Florida, or hotel was Italian themed. I can see the details in the photo, the reflection in the window, the perfect topiary, the pebbles in the flooring. I see the scratch on Jen’s chin, the dent in D’s ear… Everything. It was beautiful. Seriously thank you to your image 2 canvas. I am very grateful, and I think the prices on your site are brilliant. The quality is really good too. Often the back of pictures look scruffy, not with these. They are perfectly lined up and stapled on the back. 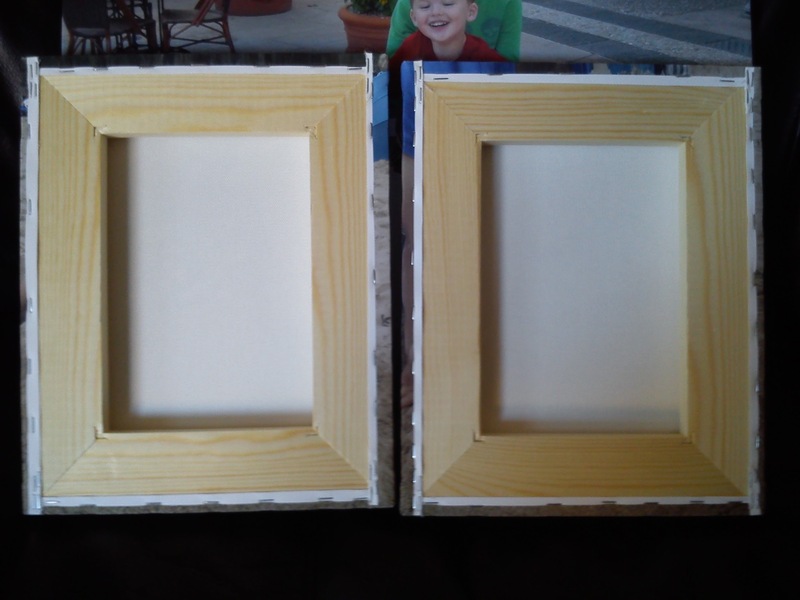 The frame itself is solid pine. Well made not just pretty. I wouldn’t buy from the more expensive well known photo places now I’ve seen these, Honestly, I’m very impressed. 9.5 out of 10, and that half mark is only missing as they don’t come with hanging hooks/string attached, but I’m positive I have some of these in a draw. There was nothing else I could fault, and these would be amazing Mother’s day pressies. Sorry Mother-in-law you can’t have these, I’m keeping them!! My opinions on the service and products are all my own.